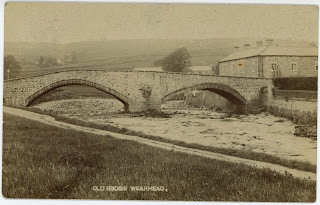 The top left shows Wearhead bridge from the top side, the right shows from the bottom side. The bottom right is from the Egglestone series of photos showing the bridge in about the 30s before any trees were there, looks a lot different without greenery! That bridge was rebuilt in 1989 and the plaque on the bottom right was placed on the wall. This is the first bridge the River Wear runs under as it leaves its source a few yards up the river.